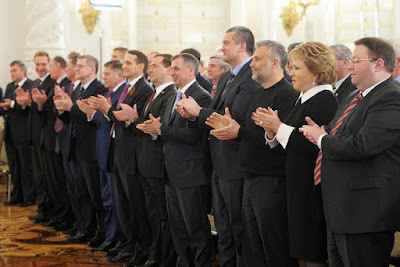 Crimean speech of President Vladimir Putin refers to a speech by the Russian president Vladimir Putin's on March 18, 2014 to both chambers of the Federal Assembly of the Russian Federation in connection with the request for admission by the Crimean parliament of the republic in the Russian Federation. 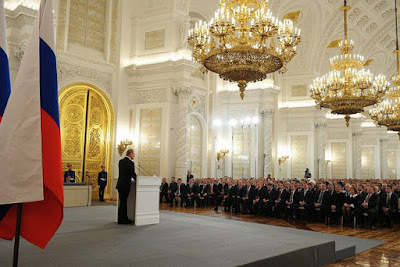 He spoke in the St. George Hall of the Kremlin. In the same place, Putin delivered another speech on December 4, 2014 that also picked out the Crimea as a central theme. In the beginning of his speech, Putin said that a referendum was held in full compliance with democratic procedures and rules of international law, and that the numbers support the entry of Crimea in Russia were very convincing. Putin recalled the ancient Chersonesos where Prince Vladimir was baptized, on the graves of Russian soldiers on Sevastopol — the home of the Black Sea Fleet. Noted that the Crimean Tatars suffered cruel injustice in Soviet times, together with the other peoples, including the Russian people. After the Crimean Tatars have returned to their land, new solutions for a complete rehabilitation of the Crimean Tatar people are required. He proposed three equal official languages for Crimea - Russian, Ukrainian and Crimean Tatar. The President stressed that in the heart of the Crimean people, Crimea has always been an integral part of Russia. Bolsheviks included a significant amount of the historical Russian southern land into the Ukrainian SSR without taking into account the national composition of its population. Further, in 1954, the Crimea and Sevastopol in the Ukrainian SSR passed. This decision was taken in violation of constitutional norms, behind the scenes, in a totalitarian state residents of Crimea and Sevastopol nothing asked. That decision was seen as a formality, since the territory transferred within the same country. 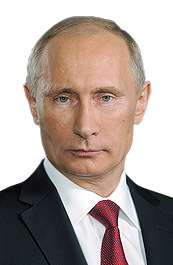 Putin condemned the West’s reaction to the events in the Crimea and sanctions against Russian and Ukrainian politicians. Russian President expressed gratitude to the people of China, praised the restraint of India. Appealed to the U.S. freedom-loving people, stressing that freedom of the Crimean population is the same value. Referring to the fact that not all allies sympathized with Germany in 1989, it merged with the German Democratic Republic, Putin said that while the USSR supported the Germans sincere desire for national unity. The President expressed confidence that German citizens support the aspirations of the Russian world to restore the unity of 'Crimea will remain Russian and Ukrainian and Crimean Tatar. It will be home to the representatives of all the peoples living there. But he will never Bandera'. Putin assured that Russia will not seek confrontation with the West and the East, and stressed that Russia and Ukraine — are one people. Ukraine will continue to live millions of Russian citizens, which means that Russia will always defend their interests. Putin’s speech lasted 45 minutes. During the speech, Putin used the term "natsional-predateli" (“national-traitors”) which is a calque from the German term Nationalverräter. The refusal to accept the new Ukrainian government he explained in the unlawful events on Euromaidan: Groups "wanted to seize power and would stop short of nothing. They resorted to terror, murder and pogroms. Nationalists, neo-Nazis, Russophobes and anti-Semites executed this coup. They continue to set the tone in Ukraine to this day." Nevertheless, he expressed appreciation to those protesting peacefully against corruption, inefficient state management and poverty. The audience has been applauding Putin for over 5 minutes at the beginning of the speech and at least 2–3 minutes thereafter. Many were shedding tears. Glenn Kessler from The Washington Post reported that several of Putin's statements were "dubious and false". UK government's response to points made by President Putin lists 7 points, among them the crimean "referendum", the accusation of terror, pogrom and murder as well as the legal status of the Ukrainian government; " (...) Parliament (...) remained unchanged and was elected in a free vote of the people in Ukraine. The interim government was approved by an overwhelming majority in a free vote in the Ukrainian Parliament, including representatives of Yanukovych’s Party of the Regions." Hillary Clinton has compared events in Crimea to the Czech Crisis of 1938 and has directly compared Russia’s Vladimir Putin to Adolf Hitler. Other politicians and journalists have done the same and have compared Crimean speech of Vladimir Putin to Hitler's speech. Barack Obama gave a speech on March 26, 2014 to counter many of the arguments made by Putin. Obama stated that the historical relations between Ukraine and Russia did not give Russia the right to dictate Ukraine’s future. He also denied Putin’s claim that the Russian minority in Ukraine was in danger and argued that the Russians actions against Ukraine were undemocratic and constituted brute force. Russian historian Andrey Piontkovsky compared the speech to Hitler's speech on Sudetenland from 1939 as using "the same arguments and vision of history". According to him, this speech played key role in starting the war in Donbass. Dear friends, we have gathered here today in connection with an issue that is of vital, historic significance to all of us. A referendum was held in Crimea on March 16 in full compliance with democratic procedures and international norms. What matters now is that this decision was made in clear violation of the constitutional norms that were in place even then. The decision was made behind the scenes. Naturally, in a totalitarian state nobody bothered to ask the citizens of Crimea and Sevastopol. They were faced with the fact. People, of course, wondered why all of a sudden Crimea became part of Ukraine. But on the whole – and we must state this clearly, we all know it – this decision was treated as a formality of sorts because the territory was transferred within the boundaries of a single state. Back then, it was impossible to imagine that Ukraine and Russia may split up and become two separate states. However, this has happened. Unfortunately, what seemed impossible became a reality. The USSR fell apart. Things developed so swiftly that few people realised how truly dramatic those events and their consequences would be. Many people both in Russia and in Ukraine, as well as in other republics hoped that the Commonwealth of Independent States that was created at the time would become the new common form of statehood. They were told that there would be a single currency, a single economic space, joint armed forces; however, all this remained empty promises, while the big country was gone. It was only when Crimea ended up as part of a different country that Russia realised that it was not simply robbed, it was plundered. Now, many years later, I heard residents of Crimea say that back in 1991 they were handed over like a sack of potatoes. This is hard to disagree with. And what about the Russian state? What about Russia? It humbly accepted the situation. This country was going through such hard times then that realistically it was incapable of protecting its interests. However, the people could not reconcile themselves to this outrageous historical injustice. All these years, citizens and many public figures came back to this issue, saying that Crimea is historically Russian land and Sevastopol is a Russian city. Yes, we all knew this in our hearts and minds, but we had to proceed from the existing reality and build our good-neighbourly relations with independent Ukraine on a new basis. Meanwhile, our relations with Ukraine, with the fraternal Ukrainian people have always been and will remain of foremost importance for us. I will state clearly - if the Crimean local self-defence units had not taken the situation under control, there could have been casualties as well. Fortunately this did not happen. There was not a single armed confrontation in Crimea and no casualties. Why do you think this was so? The answer is simple: because it is very difficult, practically impossible to fight against the will of the people. Here I would like to thank the Ukrainian military – and this is 22,000 fully armed servicemen. I would like to thank those Ukrainian service members who refrained from bloodshed and did not smear their uniforms in blood. I understand the people of Crimea, who put the question in the clearest possible terms in the referendum: should Crimea be with Ukraine or with Russia? We can be sure in saying that the authorities in Crimea and Sevastopol, the legislative authorities, when they formulated the question, set aside group and political interests and made the people’s fundamental interests alone the cornerstone of their work. The particular historic, population, political and economic circumstances of Crimea would have made any other proposed option - however tempting it could be at the first glance - only temporary and fragile and would have inevitably led to further worsening of the situation there, which would have had disastrous effects on people’s lives. The people of Crimea thus decided to put the question in firm and uncompromising form, with no grey areas. The referendum was fair and transparent, and the people of Crimea clearly and convincingly expressed their will and stated that they want to be with Russia. President Vladimir Putin has, in the last hour, signed a treaty to incorporate Crimea into Russia. Putin signed the law after a speech to Russia's parliament, in which he hit back at his critics. It comes after Sunday's referendum in Crimea, which saw overwhelming support for a union with Russia. He condemned Ukraine's "so-called" authorities, saying they had stolen power in a coup and had opened the way for "extremists" who would stop at nothing to determine the future of the country. 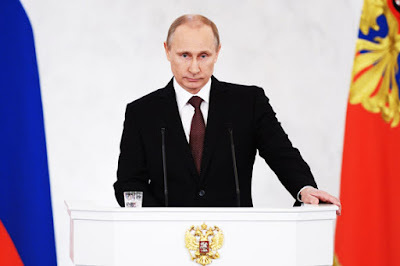 Addressing a joint session of Russia's parliament, Putin said: "Those who were behind recent events, they were ... preparing a coup d'etat, another one. They were planning to seize power, stopping at nothing. Terror, murder, pogroms were used." He called them "nationalists, neo-Nazis, Russophobes and anti-Semites" adding: "It is primarily they who are deciding how Ukraine lives today. The so-called Ukrainian authorities introduced a scandalous law on the revision of the language policy, which directly violated the rights of the national minorities." He said Moscow sees Western attempts to frighten Russia with sanctions as aggression and will retaliate. Earlier Putin signed a decree which recognises Crimea as a sovereign and independent state. The Kremlin said the order would take immediate effect. In his address to the Federal Council, President Vladimir V. Putin asks it to ratify the annexation of Crimea and Sevastopol to Russia.